Corvus is a novel by Harold Johnson. Eighty years have passed since flash floods, droughts, and tornadoes have ravaged the North American landscape and mass migrations to the north have led to decade-long wars. In the thriving city of La Ronge, George Taylor and Lenore Hanson are lawyers who rarely interact with members of the lower classes from the impoverished suburb of Regis and the independently thriving Ashram outside the city. They live in a world of personalized Platforms, self-driving cars, and cutting edge Organic Recreational Vehicles (ORVs), where gamers need never leave their virtual realities. Lenore befriends political dissenter and fellow war veteran Richard Warner, and George accidentally crash-lands his ORV near the mountain-sheltered haven of a First Nations community, they become exposed to new ways of thinking. As the lives of these near-strangers become intertwined, each is forced to confront the past before their relationships and lives unravel. 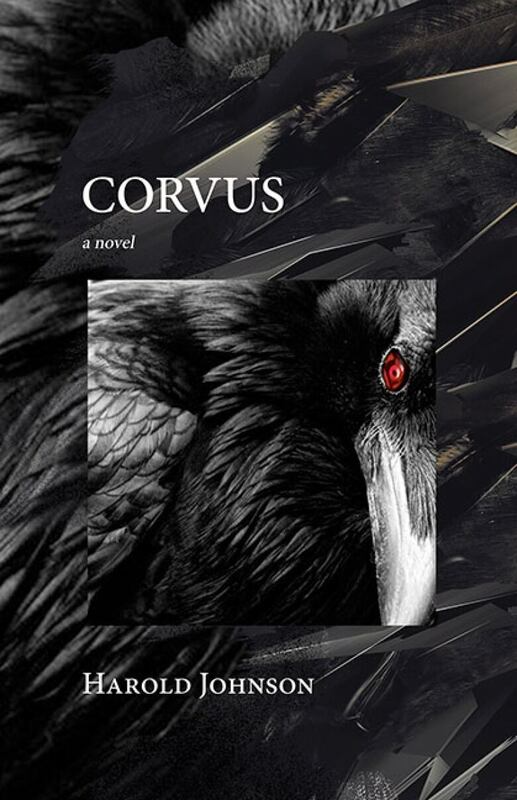 Corvus was on the Canada Reads 2019 longlist. "Corvus is set in 2084 in La Ronge. La Ronge in 2084 is a megacity. The world has changed. We're no longer arguing about global warming — it's happened. There have been periods of droughts and floods. There have been migrations of people that resulted in two wars in North America. "I wanted to write about climate change, quite bluntly. The entire book is premised on what's going to happen and Corvus is my imagining of it. I had to put in some interesting science and characters to keep the reader engaged." Read more in Harold R. Johnson's interview with CBC Books. When God quit attacking poor people who lived in trailer parks with tornadoes and began to pay attention to mansions, those who could afford it took to the sky. At 40,000 feet there are no storms. The Kenilworth, Illinois twister boosted sales in the sky cities, but most people agree that the flattening of Gladwyne, Pennsylvania marked the beginning of the exodus. George Taylor needed three more good years and he would have the down payment for his own condo above the clouds. Others argued it wasn't worth it, that the chance of being killed by a storm was probably less than the risk of living at the end of a tether. But it wasn't just the storms. George wasn't all that afraid of those. It was terrestrial people that bothered him. Not that they were terrestrial, earth wanderers; it was that there were so damn many of them and more came from the south every day. From Corvus by Harold Johnson ©2015. Published by Thistledown Press.